MIAMI, June 7, 2016 /3BL Media/ --- Carnival Corporation & plc (NYSE/LSE: CCL; NYSE: CUK), the world's largest leisure travel company, announced today that its second consecutive year of supporting The Nature Conservancy helped the organization continue its momentum in protecting the world’s oceans and seas. As part of achieving its 2020 sustainability goals, Carnival Corporation is providing through the Carnival Foundation a $2.5 million gift over a five-year period to The Nature Conservancy, which began in 2014. Helping the Bahamas expand marine protection areas by more than 11 million acres. Supporting the establishment of National Protected Area Trust Funds in seven Caribbean countries, which can be used to address specific conservation challenges as they arise. Advancing marine protection efforts at Los Haitises National Park and Samaná Bay in the Dominican Republic. Launching an Atlas of Ocean Wealth, supported by multiple international online tools, detailed maps, marine life databases and other resources to educate and inspire community leaders engaged in ocean planning. Carnival Corporation’s 2020 Sustainability Goals – embraced by the company and its 10 cruise line brands around the world -- reflect the company’s dedication to operating with a high level of responsible sustainability in the oceans, seas and ports of call in which its ships operate. The donation to The Nature Conservancy and many other environmental groups underscores its commitment. Also through the support of the Carnival Foundation, in the past year The Nature Conservancy was able to generate for decision makers new comprehensive data about coral reef conditions throughout the Caribbean, as well as research on the success of conservation efforts tied to oyster reefs and new maps of fish production connected to Caribbean mangrove growths. 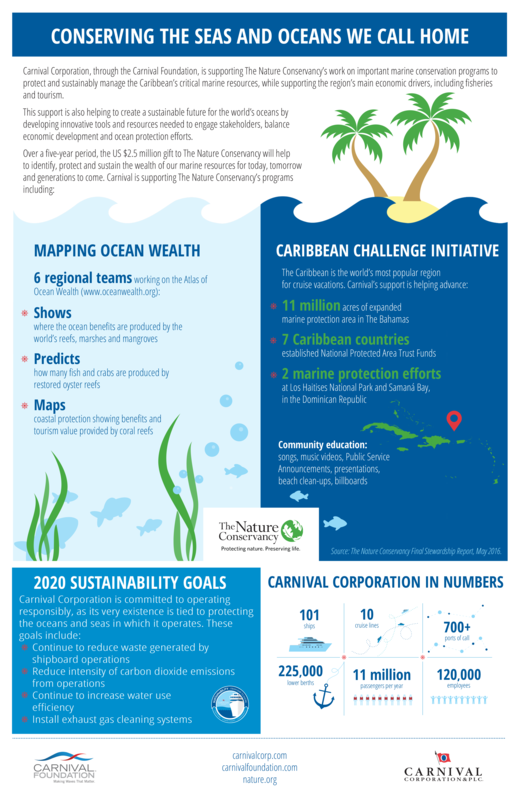 Carnival Corporation also hosted The Nature Conservancy’s 2016 Mapping Ocean Wealth conference in January at its Miami corporate headquarters, where conservationists and decision-makers from around the world came together to discuss ocean sustainability initiatives. As a result of the annual meeting, The Nature Conservancy’s data on mapping vast ocean resources is now being directly displayed in The World Bank’s Spatial Agent, its decision-support tool used by World Bank economists and government leaders to identify the most pressing social and environmental issues the World Bank can address. Public awareness campaigns are another important aspect of building support for conservation in the Caribbean. The previous year has seen a variety of community education initiatives, made possible from Carnival Corporation and the Carnival Foundation. These include the production of songs, music videos, Public Service Announcements, presentations, beach clean-ups and billboards. As with all The Nature Conservancy’s efforts, the collateral material is geared towards raising awareness and participation in initiatives designed to support a balanced approach to preserving marine habitats throughout the Caribbean and around the world. The Nature Conservancy is a leading conservation organization working around the world to protect the lands and waters on which all life depends. Together with its more than 1 million members and 600 scientists, the Conservancy has protected 120 million acres of land and 5,000 miles of rivers worldwide, and operates more than 100 marine conservation projects globally. The Conservancy works on the ground in all 50 U.S. states and more than 69 countries. To learn more, visit www.nature.org. Carnival Foundation is dedicated to creating positive change through empowering youth, enhancing education and strengthening families. In the past five years alone, Carnival Corporation — which includes 10 global brands — and its 120,000-plus employees have made more than $30 million in financial contributions and in-kind donations to a variety of local and national charities. Following the example set by Carnival Corporation's founder, the late Ted Arison, and continued by his son Micky, chairman of Carnival Corporation, Carnival Foundation endeavors to make South Florida and other communities better places to live and work. For more information visit www.carnivalfoundation.com. Carnival Corporation & plc is the largest leisure travel company in the world, with a portfolio of 10 cruise brands in North America, Europe, Australia and Asia comprised of Carnival Cruise Line, Fathom, Holland America Line, Princess Cruises, Seabourn, AIDA Cruises, Costa Cruises, Cunard, P&O Cruises (Australia) and P&O Cruises (UK). Together, these brands operate 101 ships visiting over 700 ports around the world and totaling 225,000 lower berths, with 15 new ships scheduled to be delivered between 2016 and 2020. Carnival Corporation & plc also operates Holland America Princess Alaska Tours, the leading tour companies in Alaska and the Canadian Yukon. Traded on both the New York and London Stock Exchanges, Carnival Corporation & plc is the only group in the world to be included in both the S&P500 and the FTSE 100 indices. Additional information can be found on www.carnival.com, www.fathom.org, www.hollandamerica.com, www.princess.com, www.seabourn.com, www.aida.de, www.costacruise.com, www.cunard.com, www.pocruises.com.au, and www.pocruises.com.